For more than five decades, Greater Cleveland has struggled with extremely high infant deaths in spite of many efforts to reduce them. Infant mortality is a complex issue with no single cause or solution. 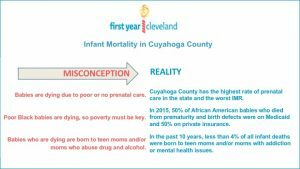 On December 30, 2015, thirteen Cuyahoga County civic leaders established First Year Cleveland to lead a new, collective framework that is laser-focused on having a data-informed, common understanding of why our babies are dying in such high numbers and on the development and coordination of aligned strategies to solve it. The City of Cleveland, City Council, Cuyahoga County Executive Office and Cuyahoga County Council have committed an initial $2 million to begin this important work. Through a competitive process, Case Western Reserve University School of Medicine was selected to be First Year Cleveland‘s fiscal agent. Other funders include Ohio Department of Medicaid and Ohio Department of Health including Cleveland-Cuyahoga County Ohio Equity Institute. First Year Cleveland (FYC) is a community movement where everyone in our community can play a key role in saving a baby’s life. Our mission is to mobilize the community through partnerships and a unified strategy to reduce the number of babies dying in Greater Cleveland. In particular, we are urgently working to reduce the number of African American babies dying and the racial disparities that contribute to their deaths. 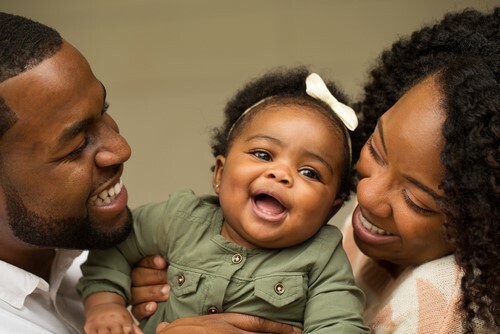 After a six-month thorough review of our infant death data and research on why babies are dying, FYC selected three priority areas: reduce racial disparities, address extreme prematurity, and eliminate preventable infant sleep-related deaths. We will be talking about extreme prematurity and safe sleep in future articles, and highlighting the work around reducing racial disparities in this article. Infant mortality rates for Cuyahoga County, OH. When we reviewed the data and held community conversations to discuss our infant mortality rates, we were able to explore many of the commonly-held misconceptions, noted below. A few common misconceptions about infant mortality are shown here. Our community is at a critical junction and addressing structural racism is key to reducing infant deaths. All eleven Action Teams focus on reducing racial disparities and our first three Action Teams are the backbone of our work. The second team, FYC Action Team 2, has a focus on learning from real voices and stories from our community to support families who have experienced a loss. This team will gain a further understanding from African American families across all social-economic levels who have experienced loss to provide context and healing and will create policies and programs to help prevent future infant loss. This team is co-chaired by Sabrina Roberts from Cuyahoga County and Tracy Carter from The MetroHealth System, with the YWCA of Greater Cleveland acting as the fiscal agent. FYC Action Team 3, co-chaired by Dr. Angela Neal Barnett of Kent State University and Christin Farmer of Birthing Beautiful Communities, is doing research on maternal stress to see how it effects both African American moms and babies. One of the current studies is exploring how to better detect stress through studying cortisol (a stress hormone) levels among African American pregnant and post-partum women. The issues around racial disparity in healthcare are well-documented in the United States, and not unique to Cleveland. Articles about the childbirth experience of Serena Williams and a deep-dive by The New York Times take a look at some of the reasons, and what they mean for the outcomes for African American moms and babies. 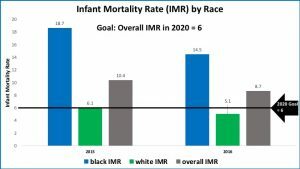 Through this work, our community is striving with urgency to ensure that there is no racial disparity in infant deaths by 2025. With the leadership of these three teams, and seven other FYC Action teams, we will continue to gain a better understanding of the roles race and maternal stress play in infant deaths. This includes understanding the impact of historical and structural racism in policies and systems. Cleveland Leadership Center provides leadership and community engagement opportunities across a wide spectrum of life and career stages to inspire, connect, and challenge individuals to make a positive community impact. We hope you can join the movement. Join the First Year Cleveland movement by joining our Community Action Council. Contact us to be added to FYC updates and receive details on upcoming Community Action Council meetings and other events. Take a Bias Test to become aware of what your particular biases are (we all have them). Try Harvard’s Project Implicit “Social Attitudes” series. You can learn more about this community collaboration of expectant parents, parents, community leaders, philanthropic organizations, government entities, health providers, educational institutions, nonprofits, faith-based and business entities in our Strategic Plan. If you have any ideas, resources, feedback, or suggestions to contribute, please email us at FYCideas@case.edu.